Based on the 1983 novel of the same name, Waterland, by Graham Swift, discusses how the events in our youth can leave a damaging mark on our future. Jeremy Irons plays English born History teacher, Tom Crick whose family life begins to fall apart when his wife suffers a mental breakdown. Unable to connect with both his students and his wife, he faces the possibility of being fired. In a desperate attempt to forge a bond with his students, he begins to recount the history of his own extraordinary life. When one challenging student Matthew – played by Ethan Hawke forces him to face shocking revelations about his youth, he realises that his buried past still has a grip on his present day life, threatening all he holds dear. Stephen Gyllenhaal (Homegrown, Losing Isaiah) directs the film which stars Jeremy Irons (Die Hard with a Vengeance, The Man in the Iron Mask), Ethan Hawke (Training Day, Total Recall), Sinéad Cusack (V for Vendetta, Wrath of the Titans) and Maggie Gyllenhaal (The Dark Knight, Donnie Dark). The beautiful Doddington Place, near Faversham was used as the ancestral home to Tom Crick (Jeremy Irons). Surrounded by wooded countryside in an area of Outstanding Natural Beauty, the imposing Victorian Manor was built around 1860. With landscaped gardens that are recognised as being of historical importance by English Heritage, Doddington place grounds spread to nearly 10 acres. The nearest town is the historic market town of Faversham which lies nestled between the North Downs and the Kent Coast. The town is home to the Shepherd Neame Brewery which is not only famous for their ales but is also the oldest brewery in England. A popular filming location, the brewery doubled as Bristow’s brewery in The Darling Buds of May. 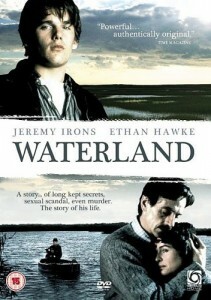 Waterland was released in cinemas in August 1992 and is now available on DVD. This entry was posted in Filmed in Kent and tagged Doddington, Ethan Hawke, feature film, Jeremy Irons, Waterland film locations. Bookmark the permalink.